Colchester Touch-A-Truck | Colchester High School | Community | Kids VT - small people, big ideas! When: Sat., May 4, 9-11 a.m.
Honk, honk! 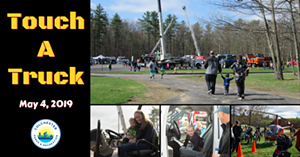 Kids and their grownups climb into the big rigs, including tractors, police cars, dump trucks, fire trucks and a helicopter. Siren free until 10:30 a.m.